Posted Monday, October 24th, 2011 by admin & filed under Service Tips. Please follow these instruction on bypassing your system. This process may vary depending on the age of your unit. Keep in mind that when your system is bypassed your water may not be safe to drink and/or may cause esthetic issues. Since by-pass styles vary, yours may not be as described. Contact us for further assistance. 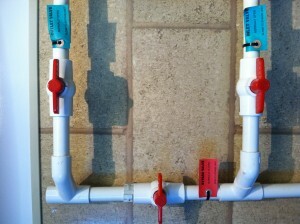 Turn both the inlet valve and outlet valve handles so the handle is perpendicular to the pipe. 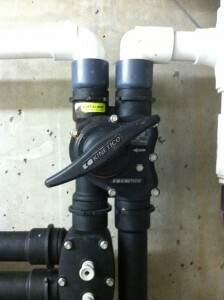 The inlet and outlet valves are typically marked with a green or white tag. Turn the bypass valve so the handle is parallel with the pipe. This valve is typically marked with a red tag. 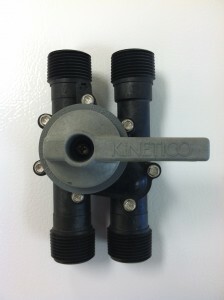 This will turn water off to and from the unit while still providing water to the house.